We have the best volunteers in the world. We can’t scientifically prove it but we can share some of their stories with you and let you see for yourself! Isabella got her first pet cat last year and found out how great caring for fabulous felines can be. So when she had to do a high school project that involved some community volunteer hours, she chose VOKRA. Now she volunteers with us every Saturday doing Cat Care and we love her. I think it’s really important because if you don’t step up, you don’t know who will. You need to take the first step. I was kind of nervous coming in, I’m like, a 15 year old kid…I felt nervous about doing anything wrong. For VOKRA there are always new cats and it’s nice to know you’re helping. And help she does. As a Cat Care volunteer at our Operations Centre, Isabella feeds cats, cleans their living areas, and, of course, plays with them. She loves how the cats meow at her when she arrives, how they all want to be loved, and how grateful they are for the time she spends with them. She says her favourite thing about volunteering with VOKRA is seeing the unique personality each cat has. She finds it so interesting that no two cats are ever the same. What’s her least favourite thing about volunteering with VOKRA? Nothing! Except I wish I could do it more. Isabella started keeping a list of her favourite VOKRA cats on her phone but abandoned it when the list got way too long. She likes to follow up once the cats go to foster, viewing their profiles on the VOKRA website and watching for those profiles to disappear which means the best thing for a rescue cat; they’ve been adopted. 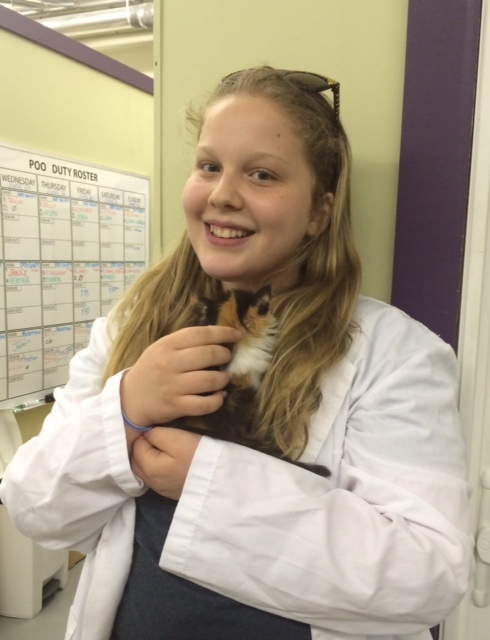 But Isabella is not just an awesome VOKRA volunteer, she’s got big plans for her future too. You probably won’t be surprised to hear that this big-hearted teen wants to help humans as much as she helps cats. I want to go to law school. I feel like I want to fight for social justice because I like to help people. Helping your community in any way you can is important. It sure is, Isabella. Thank you for all that you do. We are so lucky to have you on the VOKRA team! If you’d like to volunteer with us (doesn’t the Poo Duty Roster behind Isabella entice you? ), please fill out an application on our website. We need people to help with cat care, admin and reception duties, trapping, driving and more. Why not step up and help out some kitties too?